The Anglican Archbishop of York, Dr John Sentamu, has criticised both inhuman UK policy on asylum seekers and the anti-homosexuality bill currently going through the Ugandan parliament. In an article in today’s Times newspaper, Dr Sentamu accuses the British Government of exploiting the weak by making it more difficult for asylum seekers to make legitimate claims to stay in the country. He also condemns the reduction in benefits given to single asylum-seekers to £5 a day. He said that this “meagre” sum was the same amount he received when he arrived in Britain in 1974 after fleeing from Idi Amin’s Uganda. Archbishop of York John Sentamu - who along with the archbishop of Canterbury, Rowan Williams, is one of the global fellowship's most senior priests - made what he said was the Anglicans' first public condemnation of the anti-gay law now being considered by the East African nation's parliament. John Sentamu told the BBC the Anglican communion was committed to recognising that gay people were valued by God. He said it was important to understand the current legal move in the context of an existing legal code which went back to punitive legislation dating from the colonial era of the last century, and which predated the decriminalisation of homosexuality in Britain in 1967 – a move backed by the then Archbishop of Canterbury. These existing provisions were "bad enough already" he said, making his general opposition to capital punishment clear. "I'm opposed to the death sentence. I'm also not happy when you describe people in the kind of language you find in this private member's bill," Dr Sentamu told BBC radio. He added it seemed not only victimising but also "a diminishment of the individuals concerned". Nearly 40 percent of Ugandans are Anglicans, and the country has become a rallying point for Anglican conservatives angry over blessings given to gay marriages and the ordination of gay bishops, with some U.S. Episcopal denominations switching their allegiance to the Church of Uganda following the 2003 ordination of openly gay bishop, V. Gene Robinson. 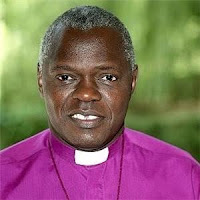 Sentamu, who was born in Uganda, said he had been in touch with his Anglican colleagues in Africa about the proposed anti-gay law, which has aroused a storm of indignation worldwide.